With all of the electronic devices today, laptops, iPads, Kindles, smartphones, DVD players, etc… many if not most travelers bring movies with them. Adult type entertainment is free with any internet connection. PPV is no longer an amenity that is on lists of top requests bu hotel guests. Your Hotel may have HD TVs but still be providing standard definition programming. SD programming looks grainy and pixelated on an HD TV. In 2017 over 80% of all homes have HD TVs with most TVs sold today being 4k. Coming into a hotel room and seeing an old CRT TV with a fuzzy picture is a complete turn off. Guests want to see a HD flat screen TV in their hotel rooms. Many hotels, even upscale properties, are installing new HD TVs but keeping the old standard definition programming because of the cost of replacing their headend and increased costs for programming from cable and other providers. Some have standard definition simply to avoid having to install cable TV converter boxes in each room to deliver HD programming. Guests want to be able to stream their own content to the hotel TV! You guest are also asking for in-room messaging with hotel staff, ads for local restaurants and businesses that deliver to your hotel, concierge services, valet, maps, local attractions, etc… Being able to access those view the hotel TV is an amenity that most guests have said they desire and enjoy. 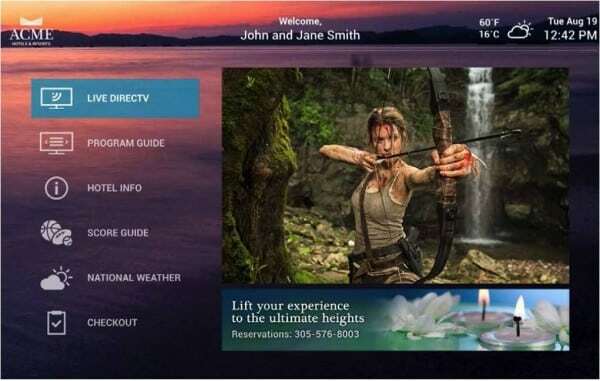 Social media sites such as Faceboook, Instagram, LinkedIn, and Twitter are a big part of everyday life for your guests and are a great app to offer on your hotel TV. More and more hotel guests are asking to be able to have the DVR functionality they have at home in their hotel room. They want to be able to pause live TV so they can make a call or take a shower and not miss a moment of their favorite shows and movies, to record a show so they can watch it when they return to the hotel at night or on their own time frame. When it comes time to upgrade your hotel television system to provide your guests with the Hotel TV experience they are asking for, Its All About Satellites has experience providing hotel televisions systems to fit the needs of all types of hotel and hospitality properties since 1996.